Gelöst zeigt die Veränderung. Den Mikrokosmos Veränderung als farbenprächtigen, chemischen Prozess im Detail. Kristallisation, Elektrolyse und organischer Zerfall wurden durch das Mikroskop auf 16mm Farbnegativfilm gebannt, diese Chemie selbst weiter verändert durch Handentwicklung im Crossprocess als E6. Die Metamorphose der Prozesse wurde durch Digitalisierung des Filmmaterials endgültig gestoppt, während sie analog fortwährt. Solved shows the change. It is the microcosmos of change as an colorful, chemical process in detail. 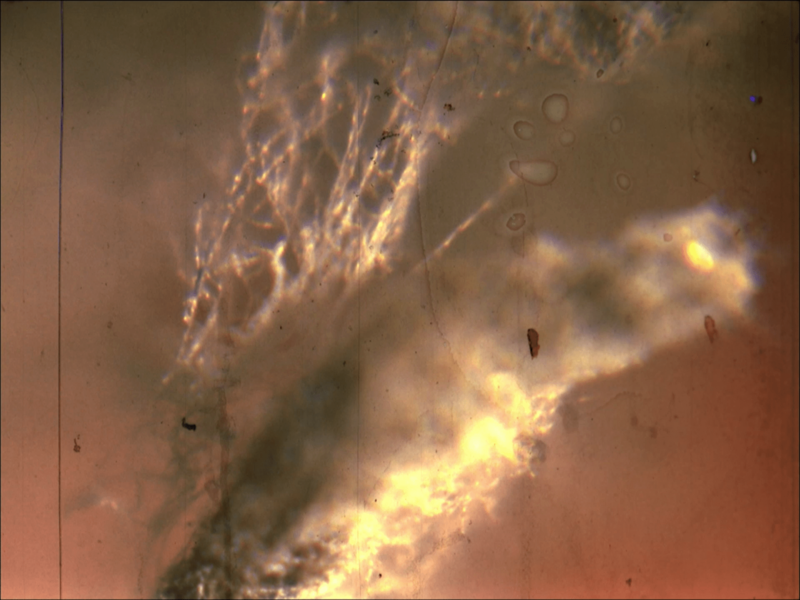 Filmed on a Bolex H16 through a microscope the processes of crystallization, electrolysis and organic dissolution were banned on 16mm color negative film. This chemistry changes again while it gets developed in the crossprocess with E6. The metamorphosis of the processes in the images can only be stopped through the digitalization of the film material, while the analog material keeps on changing. Read text by Cinema Next (in german). Sound by the fantastic Andreas Nagl. Thanks to Matthias Singer, Diana and Steffi. the same Kodak Vision 2 Color Negative Film 50D, hand processed, crossed, cooked, salted and mouldy. Das Prinzip von Gelöst wird kompromisslos fortgesetzt. Das Filmmaterial wurde dem gefilmten Vorgang selbst ausgesetzt und das Ergebnis erneut digitalisiert. Die Kristallisation wurde in Salzlösung gebadet, die Elektrolyse im Elektrolyt erhitzt und die Abbildung des organischen Zerfalls durch unsachgemäße Lagerung dem Schimmel ausgesetzt. Die Summe daraus ist Aufgelöst. The concept of Solved continues. The film material itself was exposed to the filmed processes and the result was digitalized again. 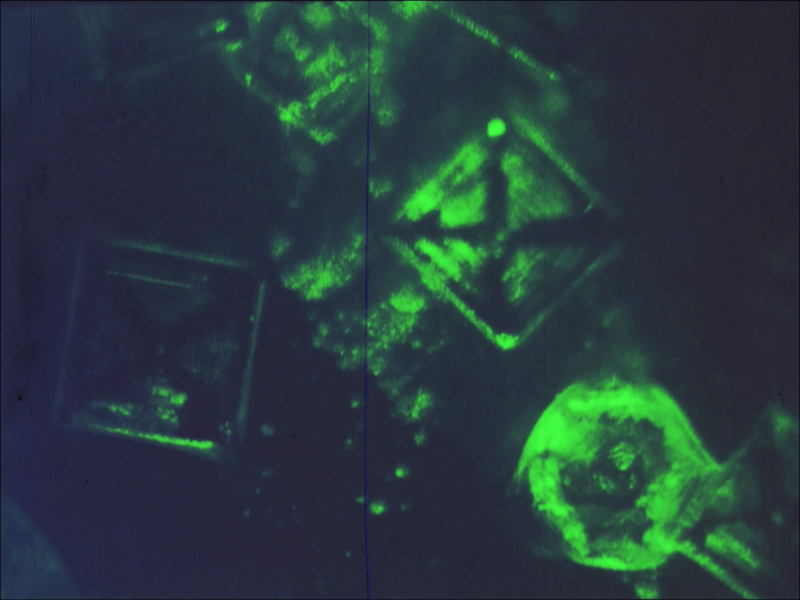 The film strip that showed the crystallization was bathed in a saline solution, the electrolysis was cooked in electrolyte and the displayed organic dissolution got mouldy through inproperly archiving. The combination of both films is Dissolved. Read text by L’emergere del possibile (in italian). The sound is still by the fantastic Andreas Nagl. Die Trilogie endet in einer farbenprächtigen Videoinstallation. Durch das Eingreifen in die fundamentale Substanz der Bewegtbildmedien (bei Film der physische Filmstreifen, bei Video der Code) beschleunigt sich der Verfall des Ausgangsmaterials. In einer digitalen Projektion als Triptychon arrangiert wird ein Vergleich vom analogen zum digitalen Niedergang der ephemeren Medien ermöglicht. Zusätzlich wird die Ruine des originalen 16mm-Films mit freiem Auge erfahrbar gemacht. The trilogy ends in a colorful video installation. By intervening into the fundamental substance of the moving image media (for film the physical filmstrip and for video the code) the decay of the source material accelerates. In a digital projection arranged in a triptych a direct comparison of the digital and analog dissolution of the ephemeral media can be made. Additionally the ruin of the original 16mm film can be observed in its three-dimensional nature. Category: 16mm, Digital, Expanded Cinema, Hybrid.